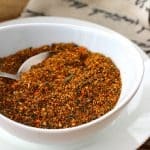 This popular Japanese spice blend dates back to at least the 17th century and has been used since as a favorite way to add flavor and heat to everything from noodles and rice dishes to grilled meats like yakitori as well as soups and tempuras. Shichi is Japanese for “seven” and togarashi means “peppers,” hence the name “seven spice” referring to the number of spices (plus nori) typically used in this blend. 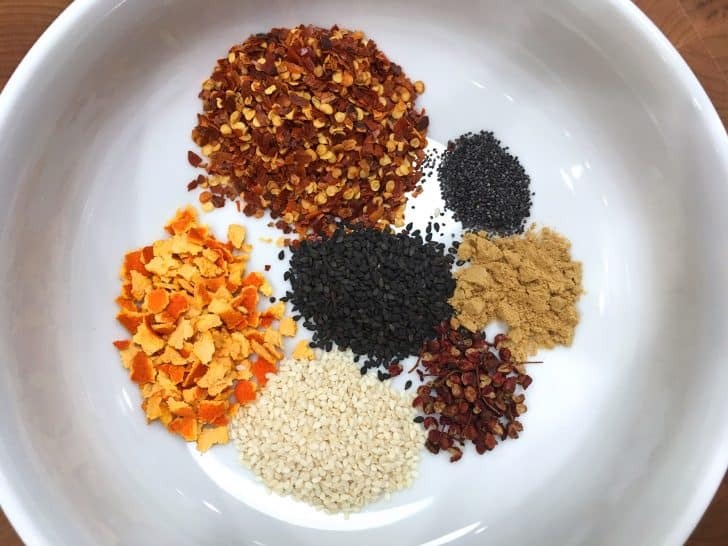 While many variations exist, shichimi togarashi typically includes red chili peppers, sanshō or sichuan peppercorns, dried orange peel, black sesame seeds, white sesame seeds, ground ginger, poppy seeds and nori (seaweed). Shichimi togarashi and nanami togarashi are very similar. Both incorporate the same ingredients at slightly different ratios, the main difference being that nanami togarashi uses a higher ratio of orange peel. 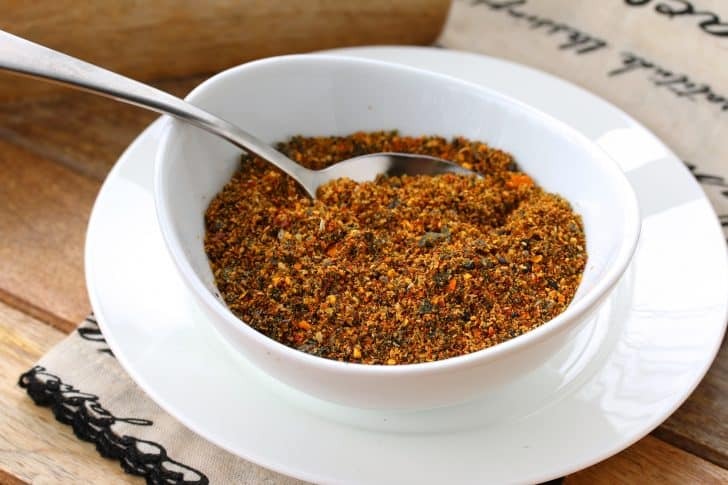 How Do You Use Shichimi Togarashi? 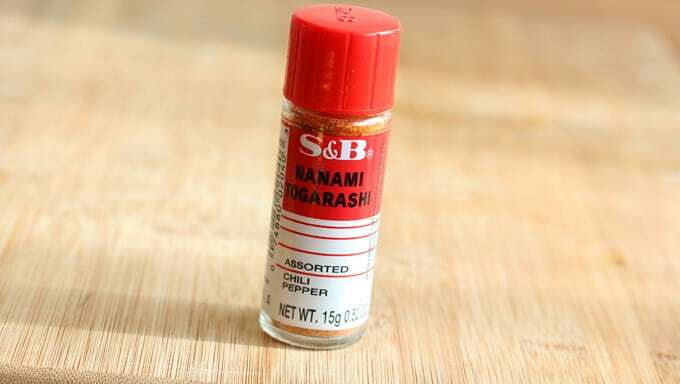 Shichimi and nanami togarashi have a wide variety of uses. They’re commonly sprinkled over udon noodles, vegetables, steamed rice, eggs, added to grilled meats, chicken (e.g. yakitori) fish and marinades, used in rubs, soups, tempuras and salad dressings. They’re even sprinkled on popcorn, fries and used to season rice cakes and crackers. 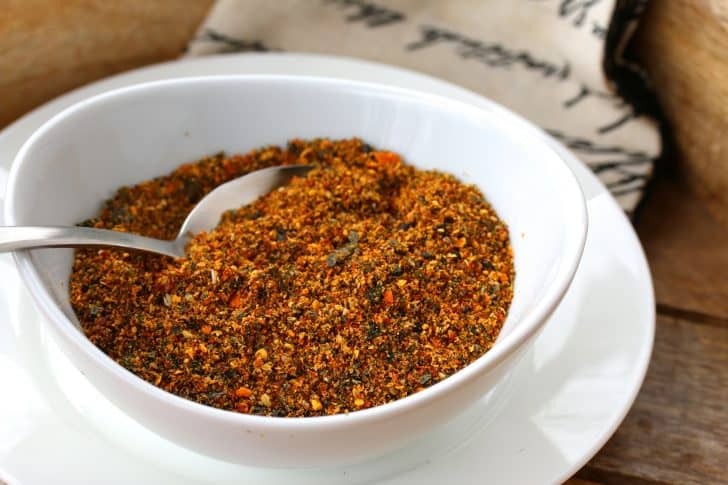 Whether the dishes are of Japanese origin or not, shichimi togarashi is a versatile spice blend that will add life and flavor to a wide range of foods. We’re using red chili flakes, dried orange peel, sichuan peppercorns, black sesame seeds, white sesame seeds, poppy seeds and ground ginger. For optimal flavor, lightly toast the sesame seeds and sichuan peppercorns in a dry skillet until fragrant, being careful not to burn them. Let them cool completely. Select some good nori. 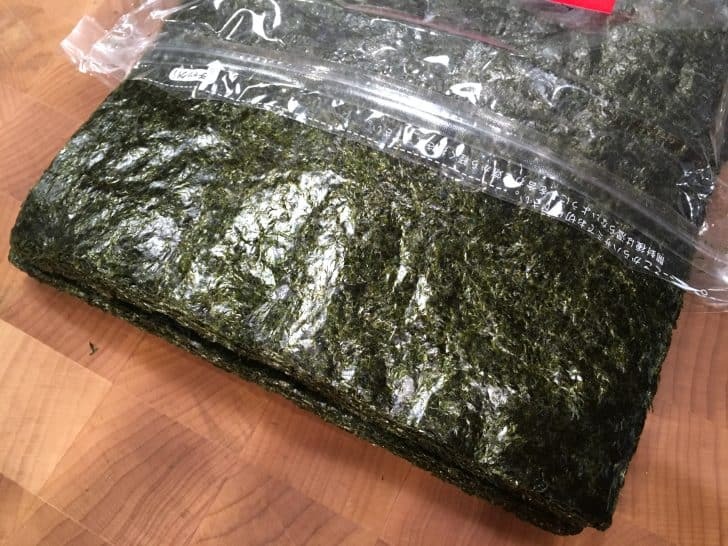 Though hard to find, I was able to locate high quality Japanese nori (most nori on the market is from China). You only need a tiny bit to make shichimi togarashi but you can use the rest for sushi rolls (my husband’s favorite) or to snack on. Once completely cooled, place all of the ingredients in a spice or coffee grinder and pulse until coarsely ground (make sure it’s coarse and not powder). Store in an airtight container. For optimal flavor use within a few weeks. 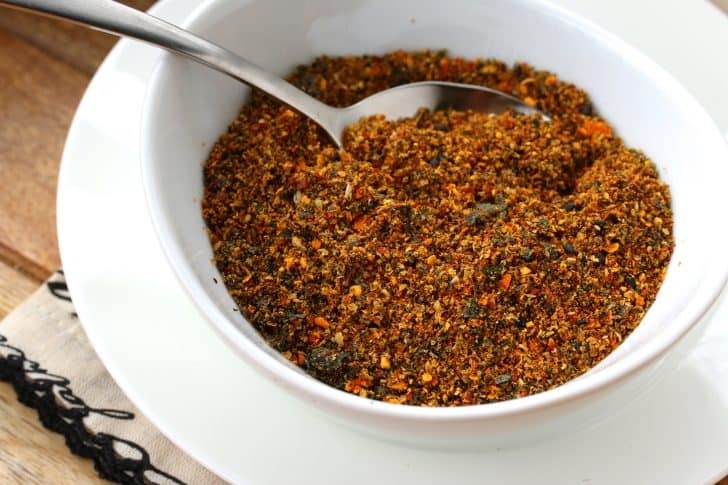 Add life and flavor to a wide variety of dishes with this popular Japanese spice blend! In a dry skillet, lightly toast the white and black sesame seeds, sichuan peppercorns and poppy seeds until fragrant, being careful not to burn them. Transfer to a bowl and let them cool completely. 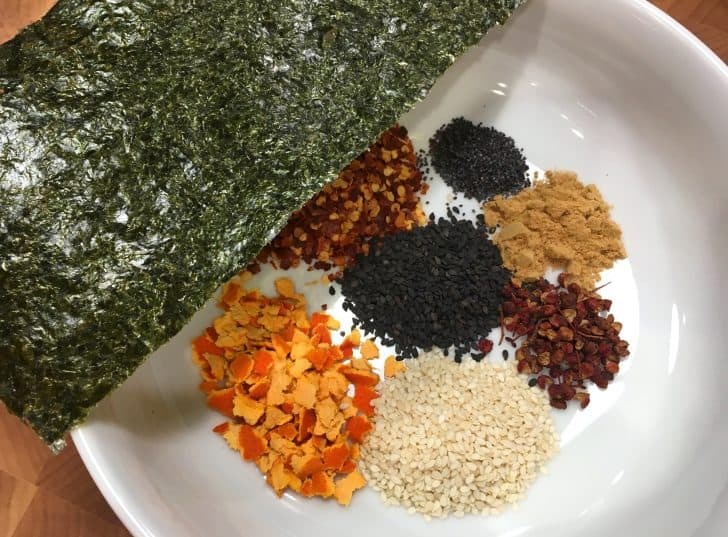 Place all of the ingredients along with the nori in a spice/coffee grinder and pulse until coarsely ground (be sure it's coarse and not a fine powder). Store in an airtight jar. For optimal flavor use within a few weeks. This looks outstanding. It has the same ingredients I’m used to from the store-bought stuff I usually get. Really looking forward to making my own, I’ve made several of your spice blends and the flavor is always vastly superior to store-bought. Thanks for this! This sounds like a really great combo of flavors! Would be wonderful on grilled chicken. Oh I have never heard about this blend but can’t wait to try it! I think it would be great in fish cakes. That’s a good idea. Think I will also try that. This sounds fantastic!! I can’t wait to make it! Oh wow! I have to make this! Thanks for sharing! A year ago today, I was touring in Japan and this delightful seasoning was provided along with a vegetarian meal served by buddhist monks at a “Temple Lodging”. It added so much flavor to the white rice. I never thought to look for it (or make it myself) so I am delighted to see it featured on your site. Thank You! 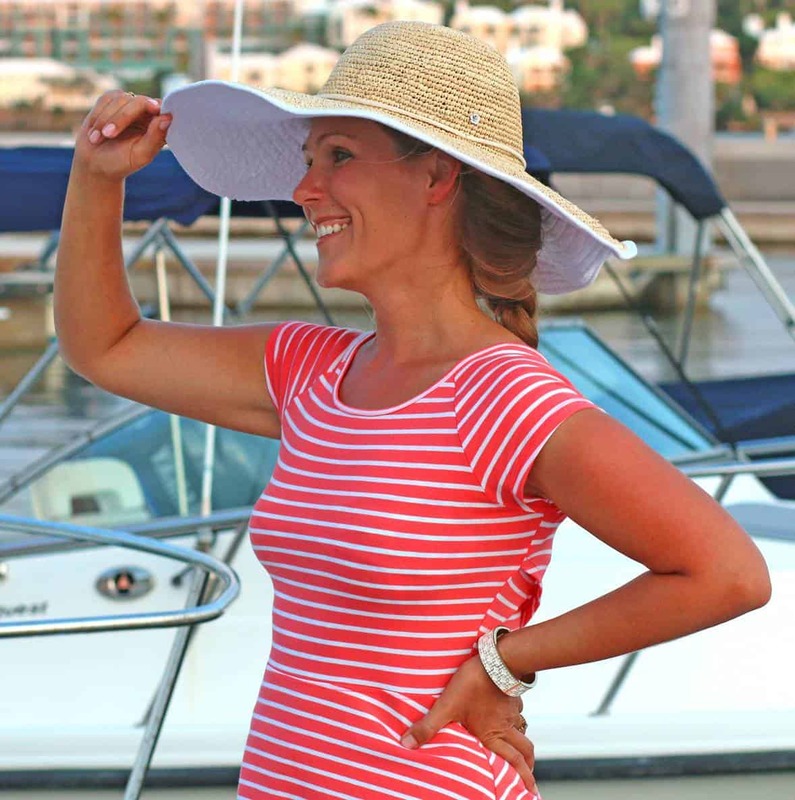 That’s terrific, Jackie, and what a great experience, thanks for sharing! If nori is not available than. Finally I can make this at home. First experience was at a very nice local recipe. The owner stopped by by to say hello. I told I am stealing this he laughed and said be my guest!!!!! I love a good homemade spice! I have to try this out! I love Japanese food and actually just bought this spice the other day at the market! I am excited to make it at home now. I’ve been buying this for years and it never even occurred to me to make my own. I made this last night and the flavor blew me away. Far more flavor than the bought stuff. I won’t be buying it again, I’m making this from now on. Excellent recipe, thank you! I’m thrilled to hear that, Nathan, thank you! Hello, I am glad to have stumbled onto your recipe. I`ve been trying Japanese dishes lately so I can put this to good use. Funny thing because I lived in Japan for two years and never noticed this at all in stores or restaurants. Other than wasabi, I never came across anything remotely spicy. Thanks to you, I can give this a shot. Hi Franklin, I’m surprised you never encountered shichimi. Perhaps it’s more common in some regions than others? When I lived in Japan, I never had udon in a restaurant that wasn’t accompanied by a small wooden bowl filled with shichimi with a tiny wooden spoon to sprinkle it over the noodles. The first time I had udon, I didn’t know the spice level of the togarashi and used about eight of the tiny spoonfuls. The proprietor was kind enough to replace my bowl of udon with a laugh, because I had rendered it inedible. I’m surprised you never came across it. I lived in the Kansai for 17 years and never saw udon served without it! Now it may just be that I didn`t realize it was being used and I was eating it, but I really don`t recall anything being spicy there. I was in and around Tokyo/Yokohama/Fujisawa and near Sapporo up in Hokkaido. Maybe other subscribers can give their input. I will definitely try this.sounds so easy! The Japanese BBQ restaurant I go to offer a herb mix for dipping the grilled meat. Is this mixture can be used that way or it is a marinade blend? Hi Yvonne, yes this can absolutely be used for dipping the grilled meat.